Win a 200% first deposit bonus at Tropezia Palace Casino. Play now! 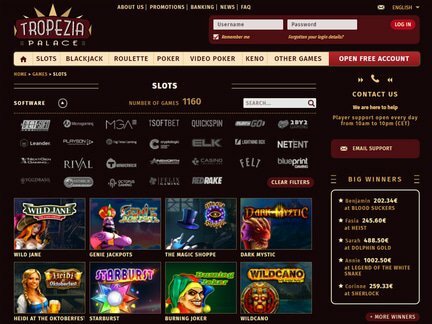 At Tropezia Palace Casino, you can find a multitude of games backed by various software companies. There is even a great chance that the site has the most number of games among online casinos. Of course, slots and matches by NetEnt are available as well as those from Microgaming, NextGen, Rival Gaming, Sheriff Gaming, Betsoft and Leander. However, progressive jackpot matches are not yet available. Unlike its rivals, navigating around Tropezia Palace Casino is very easy. The website's layout is simple and easy on the eyes so you can quickly find what you want - you could even search by category and everything loads straight to your browser. Since there are multiple providers, a big batch of new games is available weekly. New players at this site can claim a 200% free credit in their first deposit, which could be as much as €200. On top of this, there are also VIP bonuses, weekend complimentary credits and a bonus on blackjack tournaments. You can also get free credits if you refer a friend. There are many other kinds of bonuses at this site so you are sure to receive at least one. All complimentary credits must be gambled 35 times before you are allowed to withdraw it. The site's customer support staff can be reached through a phone call or live chat. Alternately, you can also reach them via e-mail if you have any concerns. Live chat support service is available only until 10 pm every day. All personnel are very efficient and friendly so you are assured all your problems will be resolved in the fastest time possible. If there is one thing that needs a little improvement at this site, it is their banking options. Although all deposit transactions can be done with all major banks, and the minimum deposit is only €12, the minimum limit for withdrawing any winnings is €100. Some people could find this amount to be a little steep. Additionally, all withdrawals have to be cleared within 48 hours before you can get the money and once it has been processed, you need to wait another 48 hours before it can be transferred to your account. That's 4 days all in all and is way too much wait for any player. 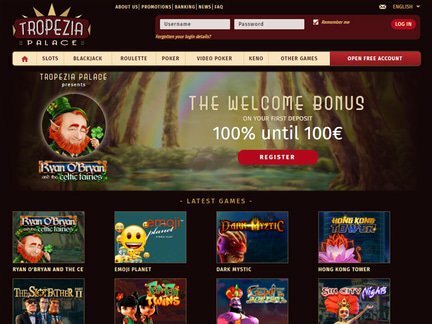 With more than 900 games on offer, Tropezia Palace Casino is the biggest betting establishment on the internet. The bonuses offered are great value for your investment and the customer support is also excellent. The only downside in this wonderful site is the long wait in releasing withdrawals but if you are patient, this establishment is among the top choice in online gaming. You will surely have a grand time because almost any game you want is available.